I‘m 1/4 Greek, you know. My great-grandfather immigrated to the United States in 1909 and my great-grandmother arrived in 1923, both passing through Ellis Island. I credit my Greek heritage with my love of bold flavors, especially in olives of all kinds. 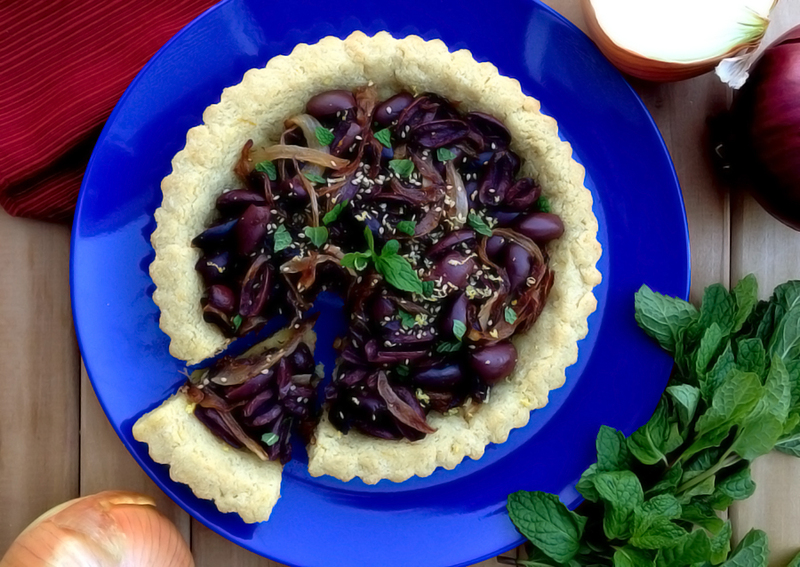 So I created this pie as a cold appetizer in which Greek Kalamata olives are the stars of the show. I added citrus to the crust and as a garnish for an unexpected pop of bright flavor. The citrus plays tricks on your mind: you’d swear when eating this that there’s sweetener in the crust, but nope! Just half an orange’s worth of zest folded into the crust and half a lemon’s worth as a garnish. Add mint and sesame and you’ve got an unusual yet tasty offering for a mezze spread. Enjoy! 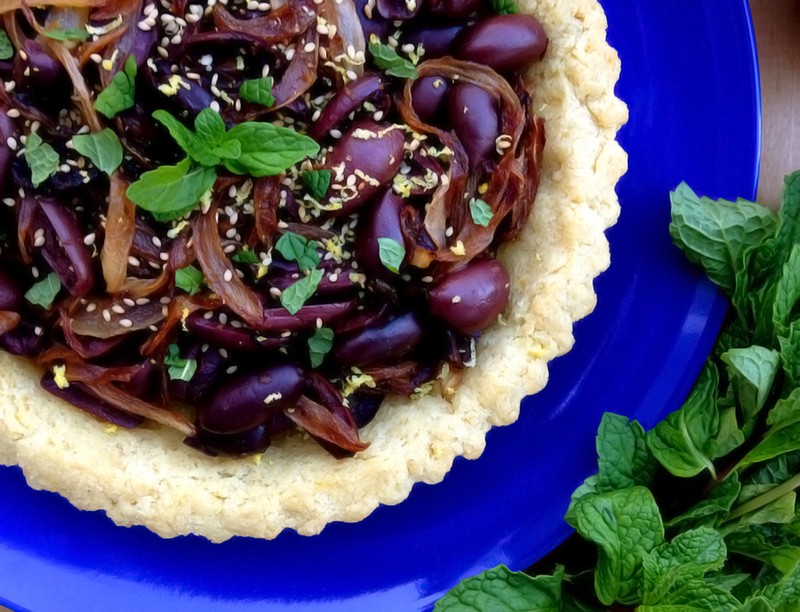 This savory pie combines the meatiness of Kalamata olives, the brightness of citrus zest, and the cooling flavor of mint for a result that's rich and exotic. Preheat the oven to 350F. Grease an 8" tart pan and set aside. Combine the ingredients for the crust in a medium mixing bowl. Press into the tart pan, and bake in the preheated oven for 15-18 minutes. The surface of the crust should be foamy and oily when you remove it from the oven but will dry as it cools. To make the filling, heat the 2 tablespoons of olive oil in a medium skillet. Thinly slice the ½ onion and sautee until very soft. Let the onion cool, then add the olives and mix in the pan. Transfer the olive mixture to the cooled crust. 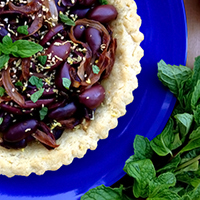 Grate the zest of ½ lemon over the pie, then sprinkle with the sesame seeds and mint. This pie is best served the same day that it is made. yesterday was my birthday I hope yours is as fun as mine was. Thank you! I had a great time today, not least of which was the birthday cake I made: Paleo German Chocolate Cake, check back here soon for the recipe! happy birthday greetings from Amserdam (via DJFoodie) 🙂 in the pie ingredients it says almond flour twice….I’m thinking that maybe one should maybe be a fat? yum, that makes more sense LOL thanks for the lovely sounding recipe and I have a new foodie to follow! Thanks! I love Kalamata olives too and there aren’t enough dishes that let them shine, in my opinion.